The potential for data analytics to disrupt healthcare delivery is large, and getting larger by the day. But in many cases, the need to hammer data into a structured format creates a barrier to productivity. Now a hospital chain in New York City is hoping to change that by adopting a Hadoop-based semantic data lake. Located in the Bronx, Montefiore Health System is the first hospital to implement a semantic data lake as part of the New York City Clinical Data Research Network (NYC-CDRN), an association of seven hospitals in the NYC area that are sharing data. As the pioneer, Montefiore is working with several technology providers, including Intel and Franz, to test a big data system capable of delivering precision medicine. Most Datanami readers are familiar with the term “data lake,” but a “semantic data lake” provides an interesting twist on the familiar concept. 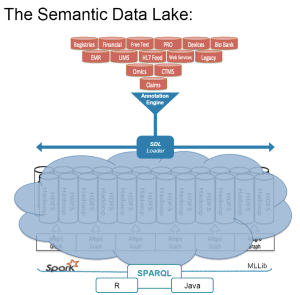 According to Franz CEO Jans Aasman, a semantic data lake employs a combination of technologies, including Hadoop, graph analytics, a semantic “triple store,” the SPARQL query language, and Spark-based machine learning, to allow doctors to connect the dots between patient conditions and a world of knowledge contained in structured internal systems, as well as unstructured data sources outside of the organization. The idea behind the semantic data lake is to leapfrog traditional healthcare analytics, which today is hamstrung by relational technologies, Aasman says. Aasman and his colleagues at Franz think the semantic data lake approach provides a more powerful and elegant solution. Instead of hammering the data into a relational schema and storing it in a data mart, they want to pull all the pertinent data—including any “linked open data” such as drug interaction databases, genetic test results, or a demographics database sorted by ZIP code–into Hadoop and HDFS. The semantic magic starts once the data is in Hadoop and HBase. Montefiore transforms all the data into semantic triples using a special ETL tool called a semantic annotation engine. Then the Franz AllegroGraph graph databases indexes all the triples and powers the SPARQL queries across the joined corpus, in addition to machine learning powered by Apache Spark ML or R.
As a result of this semantic approach, users can run queries that traverse different data sources, which was the stumbling block of traditional relational approaches. Because MOntefiore has taken the time to build a unified clinical event model that maps all the different medical coding terminologies used—not to mention coding all the possible events that can occur in a hospital (there are about 350 of them, it turns out)—knowledge can be extracted by writing queries in a relatively simple and straightforward manner that follows the Resource Descprition Format’s (RDF)’s “subject->predicate->object” approach. While data scientists may do the heavy data lifting behind the scenes to align the datasets for maximum impact, it will be the doctors and other medical practitioners who will put the insights into action. But patients are the ultimate beneficiaries. The potential for healthcare analytics becomes richer when you bring other factors into the equation, such as a patient’s race, gender, age, genetic makeup, physical health, and even their ZIP code. “And then link it to all the other people who have the same makeup–that’s clearly something that doctors don’t know yet, and that’s the whole promise of healthcare analytics,” he says. Once the semantic data lake has been fully implemented at Montefiore Medical Center, the plan calls for the other six healthcare organizations in the NYC-CDRN to adopt it too. At that point, the lake will contain data on 2.5 million patients.